Things to Consider When Buying a Magnetic Sweeper | IPES International, Inc.
Are you interested in investing in a magnetic sweeper that’ll make it easy for you to pick up loose nails, screws, bolts, and more on construction sites? Before you do, there are some factors that you should carefully consider. It’ll help you find the magnetic sweeper that’ll work best for your specific situation. 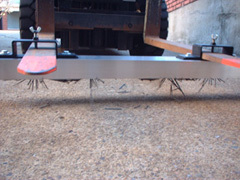 Here are some of the things to think about when shopping around for magnetic sweepers. Look for a magnetic sweeper that’s long enough for you. If you’ve ever spent 30 minutes or so pushing a broom around, you know that it can take a toll on your lower back. Magnetic sweepers are heavier than brooms and can make things ever harder on your back if they’re not long enough. Look for one that has a long enough handle on it. Ideally, you should keep an eye out for one with a telescoping handle that’ll be easy to manage. Search for one that will provide you with enough magnetic power. Do you plan to use your magnetic sweeper to do a bunch of smaller cleanup jobs? Then one with a magnetic capacity of about 1 pound should do the trick. But if you’re planning to utilize your magnetic sweeper for more heavy-duty jobs, you might want to find one with a magnetic capacity of up to 10 pounds. It’ll cut down on the number of trips you must take to unload the metal pieces you pick up. Find one that’s constructed out of durable materials. You’re probably not going to put the same kind of strain on your magnetic sweeper that you do some of your other tools. But that doesn’t mean you shouldn’t still find a magnetic sweeper that’s durable enough to last a long time. Look around for one made from high-quality materials that will stand up to whatever jobs you throw at it. If you’re looking for one of the best magnetic sweepers on the market, IPES International can provide it for you. Call us at 412-781-4660 today to hear about the amazing magnetic sweepers and magnetic brooms we have in stock.